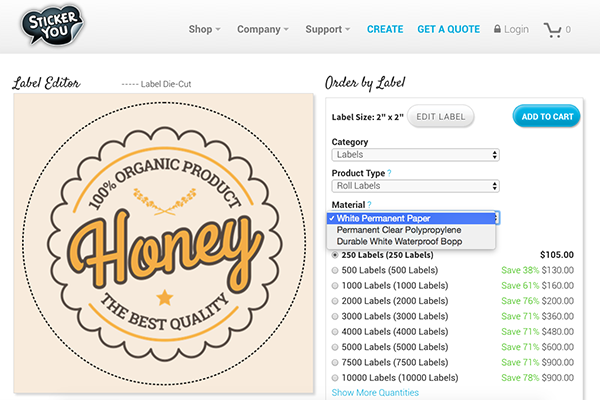 Roll labels are the perfect packaging choice for budget-conscious entrepreneurs who need to order labels in bulk, so that’s why we at StickerYou have made it easier than ever to create and order cost-effective, high-quality roll labels without all the fuss. Each of our four roll label materials has its own unique features and best end-use applications, which may leave you questioning which one is truly your best option for your needs. 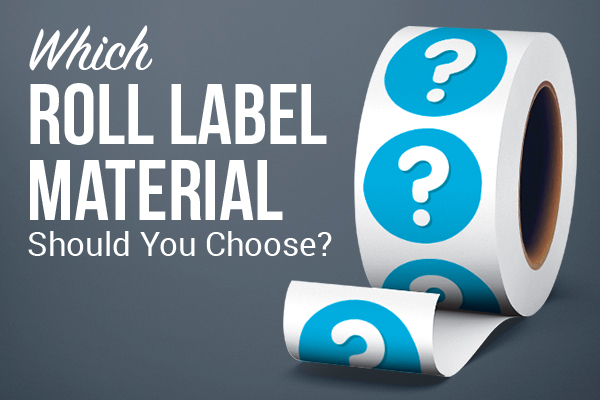 We want to help you find the right roll labels for your business, event or project. 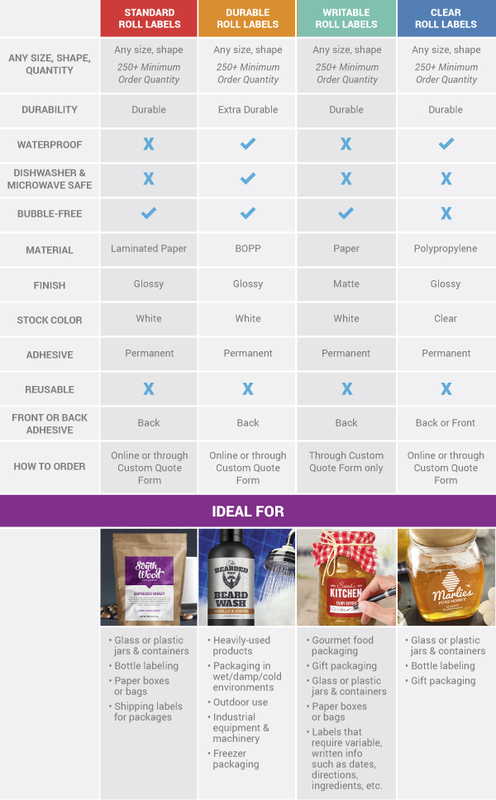 At the request of our customers, we've created this handy chart to help you determine which material you need. Create custom roll labels that make your brand stick - even on a tight budget! Note: The minimum order quantity for roll labels is 250. If you need less than 250 labels or prefer labels on sheets, check out our other custom label options printed on sheets or individually-cut handouts with no minimum order quantity. Roll labels are usually priced per sticker or label, and price breaks exist at certain quantities. A sales representative will be able to advise you on where these price breaks exist. You can get in touch with a sales representative here. Pricing for roll labels i based on the size of the labels and the quantity you wish to order. Labels of unusual die cut shapes may have a slightly higher cost as a unique die will need to be manufactured to cut these labels. Labels with many different colours may also have a slightly higher cost than labels that have four or less ink colours. Specialty effects for roll labels are available; such as foil effects, embossing, debossing, spot UV coating and perforated rolls. To find out more about these effects or add them to your roll order, request a custom quote. Roll labels will be delivered as rolls, not as single stickers or labels. You can upload your logo or design to our online platform or create your own using our design tools. Once you have designed the perfect label in our Label Editor, click the blue Done Editing button. Now you can select your label material! Note: Only standard, durable, and clear roll labels can be designed on our website. Writable roll labels can only be ordered by filling out this custom quote form. Got another project on your mind? Read more about StickerYou's product quality or test out all our most popular materials yourself by requesting a free sample pack! For even more DIY small business, branding, and life hack ideas, check us out on Facebook, Twitter, Instagram, Pinterest, Google+, and YouTube.